"The command headed for the ford, pressed closely by Indians in large numbers, and at every moment the rate of speed was increased, until it became a dead run for the ford. The Sioux, mounted on their swift ponies, dashed up by the side of the soldiers and fired at them, killing both men and horses. Little resistance was offered, and it was complete rout to the ford. I did not see the men at the ford, and do not know what took place further than a good many were killed when the command left the timber. "Just as I got out, my horse stumbled and fell and I was dismounted, the horse running away after Reno's command. I saw several soldiers who were dismounted, their horses having been killed or run away. There were also some soldiers mounted who had remained behind, I should think in all as many as thirteen soldiers, and seeing no chance of getting away, I called on them to come into the timber and we would stand off the Indians. of the campaign. Many did not return. man, understood the Indians, and if they would do as I said I would get them out of the scrape which was no worse than scrapes I had been in before. About half of the men were mounted, and they wanted to keep their horses with them, but I told them to let the horses go and fight on foot. "We stayed in the bush about three hours, and I could hear heavy firing below in the river, apparently about two miles distant. I did not know who it was, but knew the Indians were fighting some of our men, and learned afterward it was Custer's command. Nearly all the Indians in the upper part of the valley drew off down the river, and the fight with Custer lasted about one hour, when the heavy firing ceased. When the shooting below began to die away I said to the boys 'come, now is the time to get out.' Most of them did not go, but waited for night. I told them the Indians would come back and we had better be off at once. Eleven of the thirteen said they would go, but two stayed behind. "I deployed the men as skirmishers and we moved forward on foot toward the river. When we had got nearly to the river we met five Indians on ponies, and they fired on us. I returned the fire and the Indians broke and we then forded the river, the water being heart deep. We finally got over, wounded men and all, and headed for Reno's command which I could see drawn up on the bluffs along the river about a mile off. We reached Reno in safety. "We had not been with Reno more than fifteen minutes when I saw the Indians coming up the valley from Custer's fight. Reno was then moving his whole command down the ridge toward Custer. The Indians crossed the river below Reno and swarmed up the bluff on all sides. After skirmishing with them Reno went back to his old position which was on one of the highest fronts along the bluffs. It was now about five o'clock, and the fight lasted until it was too dark to see to shoot. "As soon as it was dark Reno took the packs and saddles off the mules and horses and made breast works of them. He also dragged the dead horses and mules on the line and sheltered the men behind them. Some of the men dug rifle pits with their butcher knives and all slept on their arms. "At the peep of day the Indians opened a heavy fire and a desperate fight ensued, lasting until 10 o'clock. The Indians charged our position three or four times, coming up close enough to hit our men with stones, which they threw by hand. Captain Benteen saw a large mass of Indians gathered on his front to charge, and ordered his men to charge on foot and scatter them. "Benteen led the charge and was upon the Indians before they knew what they were about and killed a great many. They were evidently much surprised at this offensive movement, and I think in desperate fighting Benteen is one of the bravest men I ever saw in a fight. All the time he was going about through the bullets, encouraging the soldiers to stand up to their work and not let the Indians whip them; he went among the horses and pack mules and drove out the men who were skulking there, compelling them to go into the line and do their duty. He never sheltered his own person once during the battle, and I do not see how he escaped being killed. The desperate charging and fighting was over at about one o'clock, but firing was kept up on both sides until late in the afternoon." Connell, Evan S. Son of the Morning Star (1984); New York Herald (July 1876); Utley, Robert M. Cavalier in Buckskin; George Armstrong Custer and the Western Frontier (1988). 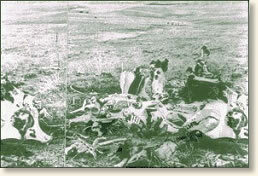 "The Battle of the Little Bighorn, 1876," EyeWitness to History, www.eyewitnesstohistory.com (1997).